We recently told you that Diamond Platnumz will pay heavily for his actions, it looks like the process of dumping him is on already. It has started with social media. The mom of his two children (Tiffah and Nillan) has deleted all his pics from Instagram and other social networks except for those when he is posing with Zari's mom. The latest pics of their Mombasa vacation are all gone and no where to be seen. It should be recalled that those were the last pics the couple took while still on good terms, but from the time Diamond revealed that he was the father of Hamisa Mobetto's son, Prince Abdul, he is left with one word on his lips, Hallelujah which is his latest song that he did with Morgan Heritage. Diamond arrives today and was expected to come with Zari, but its highly unlikely that she will be coming along looking at the developments. Oct 2 was Diamond Platnumz birthday, he turned 28 and a series of pre-birthday parties were held in Tanzania of which Hamisa Mobetto attended some, but Zari was a no show not even a birthday wish on her timeline. It's said that Platnumz sponsored Prince Abdul 40 day party and the amounts involved were not anywhere close to what he spent on his children with Zari. This and the three pre-birthday parties have left Zari with no choice, but to move on. "No more validation of guys on social media only for them to make you look like a fool," Is her latest post on Snapchat as she continues to delete Diamond Platnumz images on Instagram. "If you don't invest in yourself, no body else will. It all starts with you. Happy paper chasing day..." Is her latest post on Instagram clearly letting you know that the roof is on fire. "It's done done done ... Zari call it off hope most of you are very happy... that's what most of you wanted... you can now celebrate....#Haters.... there's no Zari & Diamond .... this has nothing to do with Hamisa... Zari decided to let it go coz Diamond can't keep his ___ in one ___ and Zari can't deal with a community____so out of respect she decided to call it off, " One commented. 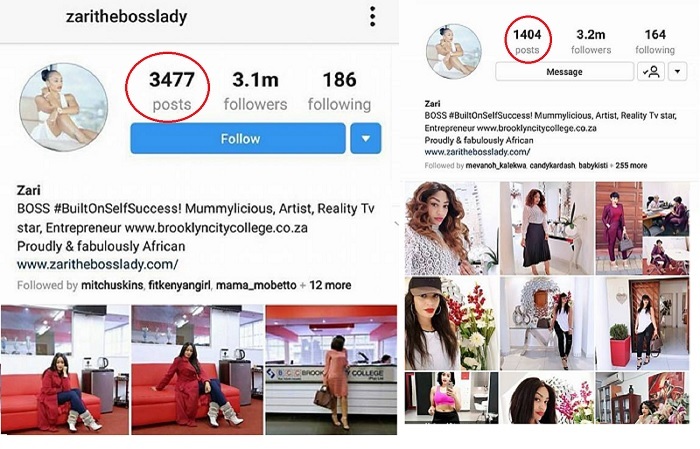 Again, looking at Diamond Platnumz Instagram page, all pics in which he appears with her have been deleted leaving Hamisa Mobeto with the last laugh in her lastest post; "Even when she loses, she wins."